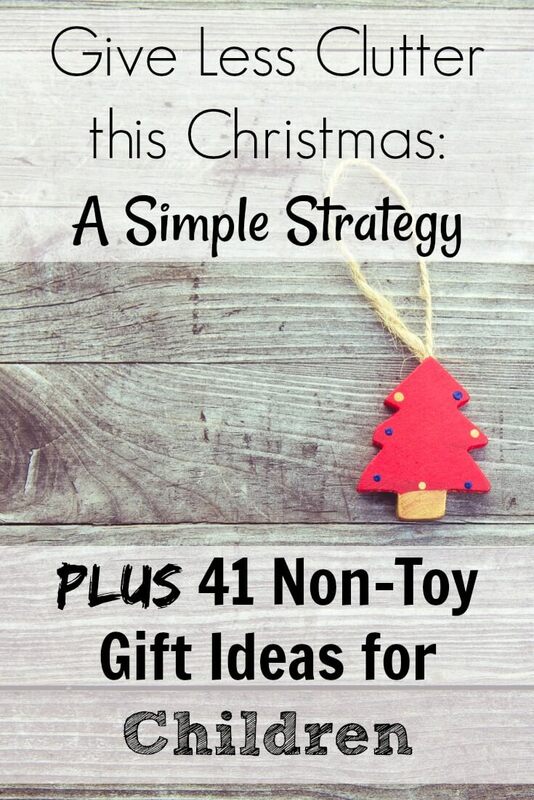 When simplifying gifts for children, a simple strategy can make a big difference. Generally, we keep it to one gift per-person and one family gift. 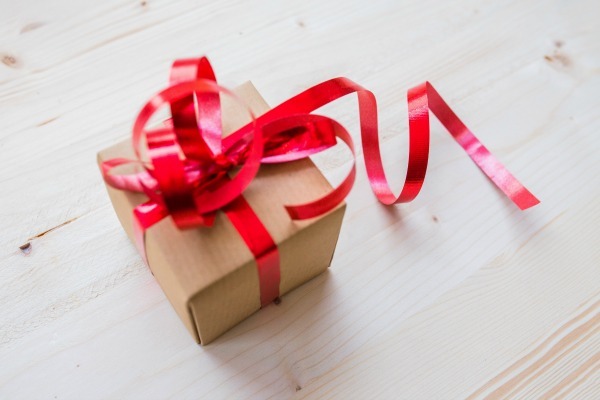 I much prefer keeping the number of gifts to a lower number, not only does that simplify my shopping, but it simplifies the day of giving as well. When there are more gifts than that, I feel overwhelmed and struggle to enjoy opening presents. Christmas morning, the kids will open their stockings, which are fairly simple and practical. After a breakfast of homemade cinnamon rolls, we all sit down and pass out the presents, opening one at a time so everyone can celebrate with the gift receiver. The personal gifts are specific to each person, based on their interests. Then we have something that the younger kids share. This has been a lego set, a board game, hot-wheels track set, basketball or swing. It’s wonderful to give gifts to the children in our lives, this year, commit to making the focus of gift giving on memories instead of stuff. Something for their room. Do they need a lamp, alarm clock or shelf? Perhaps an organizing caddy to help keep their art or hobby supplies under control. Many older kids enjoy displaying their lego creations on a shelf where younger siblings can’t reach. Coupons. An envelope of coupons that they can “spend” at any time: I’ll do one chore- no questions asked, movie and popcorn night, you pick the movie!, 1:1 game of cards or basketball (whatever the child’s interest is in), sit and read a book with me, Stay up 1/2 hour past bedtime. Dress Up Clothes. Some of the most fun my kids have had have been with 2 old wigs and play silks that they created dresses or capes out of. Books. Books are always excellent options and typically aren’t considered “toys”. Audiobooks. Audiobooks are great for all ages, it’s great for downtime for kids. A Watch. The average child these days doesn’t know how to read analog or finds it takes too long to think about it, so they search for a digital watch. Getting them a cool watch makes them want to be able to tell time on it. Young, tweens and even teenagers can be excited about this. Puzzles are great activities for when kids have to be indoors. It’s a good practice to have individual quiet times during the day, and having a puzzle to sit and work on by themselves helps brain development and problem-solving skills. Games teach a lot too! Monopoly and PayDay have been popular and help cement math skills. Memory games are great for younger children. Settlers of Catan and Ticket to Ride are great for older kids. A Swoop Bag is a huge help for children and parents alike. Great for legos or sets of small toys that the kids like to play with, the swoop bag makes clean up and storage so simple. Calendar. Many children like to know what is going on, what day it is, how many days until ____. Give them their own calendar so they can plan everything out. Photo Album Little ones love looking at a picture of family members and of themselves doing things or at special places. Costco and digital photo site let you create a photo book of all the special people and special things the child has done. Sleeping Bag. Having their own sleeping bag can make little ones pretty excited about sleepovers, trips or camping out family nights. Wallet. A wallet is such a grown-up thing, which makes it extra exciting. For the young ones, it’s best if it has some zipper pockets as well as areas for bills. Math Counters. Kids will totally end up playing with these animal counters, we keep ours in a small bucket and bring them out when everything else is put away. We stack colors together, make patterns, practice adding and subtracting. We have a lot of fun with these. Donations. Children understand more than we think they do, generally, they are caring and thoughtful of others. If you explain to them that some people don’t have food to eat, or a nice place to sleep and the children have to have jobs, they can sympathize with that. There are many places that take charitable donations, help those in need and send a card or a plush animal to someone you love. We personally like World Vision and Compassion International. Real Fishing Supplies. If you are an outdoor family, you know high-quality supplies are easier to use and work better than any of the character/cutesy supplies they market to gets. It’s much more fun to take children into the outdoors when the adults don’t have to fight the equipment. If you get a telescoping rod, it means the kids can transport their own to the fishing spot and not worry about damaging it. Real Camping Supplies. Just like the fishing stuff, higher quality supplies are easier to use, even if they aren’t as “cool”. Quality equipment can last them their entire lives. Real Gardening Supplies. Again with the real- but real is good! Having their own set is special and makes working easier for them. Add everything to a pot with some dirt and seeds and they can grow something fun right away. A Digital Camera. Help them develop good photography skills. A point and shoot is great to start out with, and if your photographer an older teen and in need higher end equipment, it’s a great time to learn those skills. Jewelry Box & Real Jewelry. Having a great place to store jewelry without losing earrings and getting necklaces tangled is a true gift, but also getting them into the habit of putting jewelry away will help them their entire life. An Umbrella. My kids beg to be in the rain with an umbrella and it’s a great way to show that you are paying attention to their interests with a themed umbrella. Great giving ideas. I find myself appreciating the wisdom of having a well throughout plan, more and more. I find that time of year overwhelming to the senses. LOL. Overall it’s a great time to create wonderful experiences and memories. I love this list and at the same time it is something that I really struggle to implement. Growing up, Christmas was like an explosion of gifts and I loved it. So that is what I did with my kids prior to my mindset change a few years ago. Even now the thought of only one gift per person is something that would be very difficult for my family to accept. How do you get your family on board?? This is an awesome list!! Thank you for all of these great ideas! Do you have any jewelry boxes you can link to? Thank you for this creative and useful list!